Fine Lines, Miyuki Bead specialists, with the largest selection of Delica's in 1000's of colours, in 4 different sizes! Plus a whole lot more............ Triangles, squares, drops, bugles, twists, Tilas, half Tilas, Spacer Beads, Peanuts and long magatamas. .
For a quick and easy way to check what size your particular colour bead comes in just try typing the colour number into our search engine. We look forward to forging a long and lasting relationship with all of our customers and are happy to attend bead groups with our travelling shop, or offer a full workshop programme for all abilities. OUR HUGE STOCK OF DELICAS ARE NOW AVAILABLE TO ORDER IN 50 GRAMS QUANTITIES. THESE CAN BE SPECIALLY ORDERED FOR YOU AND GIVE YOU A 20% DISCOUNT ON NORMAL 5 GRAMS PRICE. 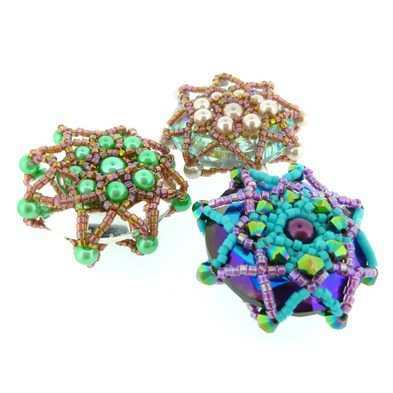 Check at my latest pattern "Cosmic Mandellas" included with the pattern is a 30mm Crystal Ring. A simple but stylish pendant which you can make in less than two hours. We are pleased to announce the arrival of Miyuki Delica in the new Duracoat finish. These beads have been very popular and are selling out quickly. Please bear with us whilst we stock and replenish if they are out of stock.